I share an apartment with two of my college girlfriends. One was my next-door neighbor for three years, and both lived on my freshman hall. I’ve known them for a while, in other words. I know about their obsession with fiber, their exercise regimens, and their morning routines. In all that time, I somehow missed their absolute addiction to coffee cake. I mean, I knew they were tempted by my other baking exploits. But mostly they’ve resisted the cookies. And I don’t really do brownies. So I couldn’t believe it when the vultures descended (wait, was that not flattering? good thing they don’t check this blog!) within minutes of coffee cake baking completion. This may be the reason that the cake is already carved up in the photo. But I can’t confirm that. Stir remaining ingredients until blended. Mix in a 1/4 of the Streusel topping and spread in pan. Cover with Cinnamon Streusel. If you like your topping moist rather than dry (like I do), spray Streusel topping evenly with PAM or other cooking spray before placing in the oven. Bake 18 to 22 minutes or until inserted toothpick comes out clean. 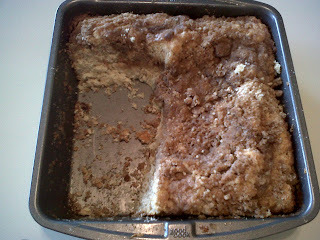 I love Bisquick coffee cake. I always make double the topping. My sister-in-law makes this every thing she comes to town but somehow she always makes it come out so dry. I've been scared off by that but maybe I just need to try it myself.